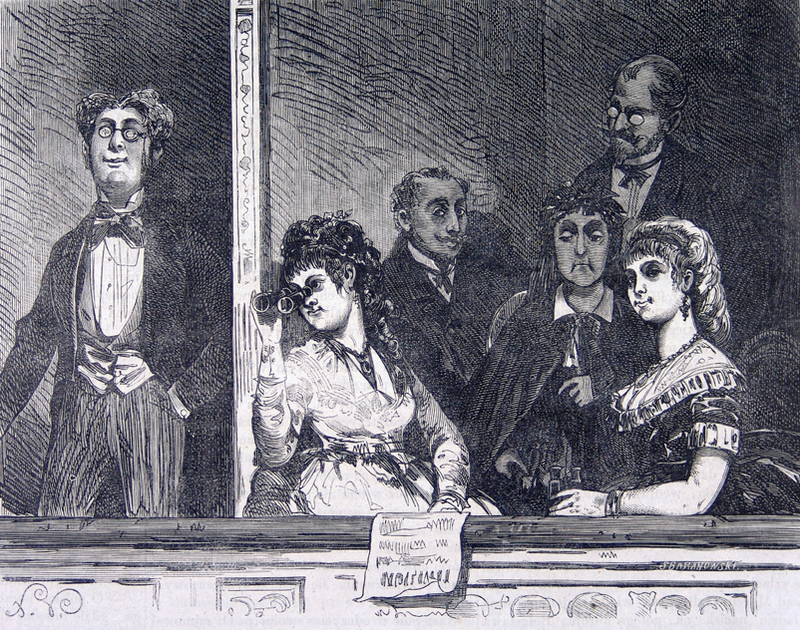 On 19th November 1765 His Royal Highness Stanisław August Poniatowski's Operatic Players presented their first performance of Józef Bielawski's comedy The Interlopers (Natręci) based on a play by Molière. Since the Operatic Players were the first professional company to play in Polish, it has become a tradition to commemorate the date as that of the birth of Polish National Theatre. Two years later, the Players' activity was interrupted by the political disturbances, which led to the First Partition of Poland (as a result of which parts of the country's territory were annexed by its three powerful neighbours: Russia, Austria and Prussia). The theatre bill passed in 1774 allowed the company to resume its activities. No longer boasting the title of court players, from then on it was directed by private entrepreneurs. 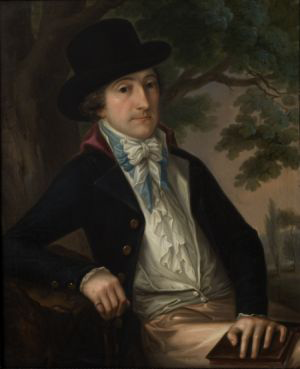 The actors performed in Radziwiłł Palace (now the residence of the President of Poland) where Wojciech Bogusławski - actor, playwright, theatre producer and stage director, considered as the 'father of Polish theatre' - made his debut in 1778. 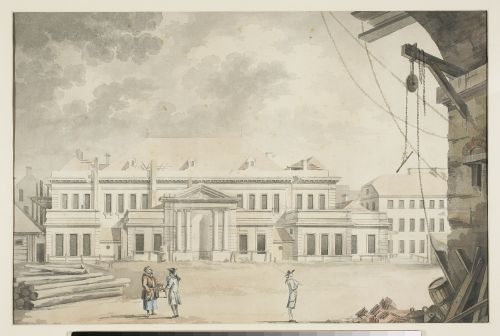 In 1779 the theatre acquired its own building, which was to become its permanent seat for the next thirty years. 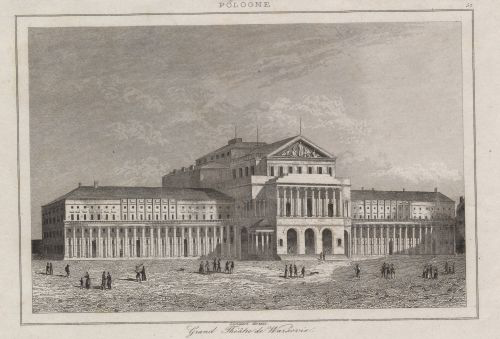 In 1825, in view of the growing dilapidation of the old building, the decision was taken to construct an entirely new theatre complex, to be designed for this purpose by Antonio Corazzi. Inaugurated on 24th February 1833, it took the name of the Grand Theatre (as a result of the successive partitions of Poland, the eastern part of Poland, including Warsaw, was incorporated into Russia, whose rulers, especially after the unsuccessful Polish national uprising of 1830-1831, were unwilling to tolerate the functioning of a 'National' theatre). In the intermediary period of 1829-1833 the Variety Theatre came into being which presented light plays in the public hall of the Charitable Society building. 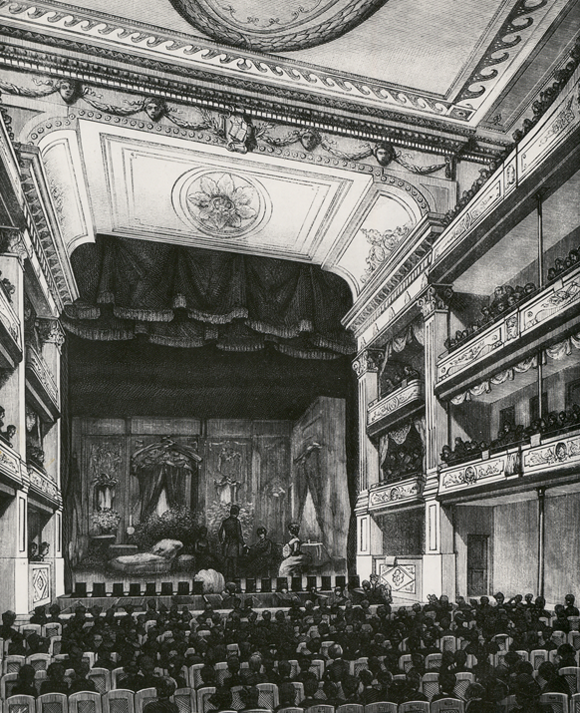 In 1833 the Variety found shelter in the Grand Theatre's right wing: initially in the Sale Redutowe (Mask Ball Rooms), and eventually in its own separate premises (1836). 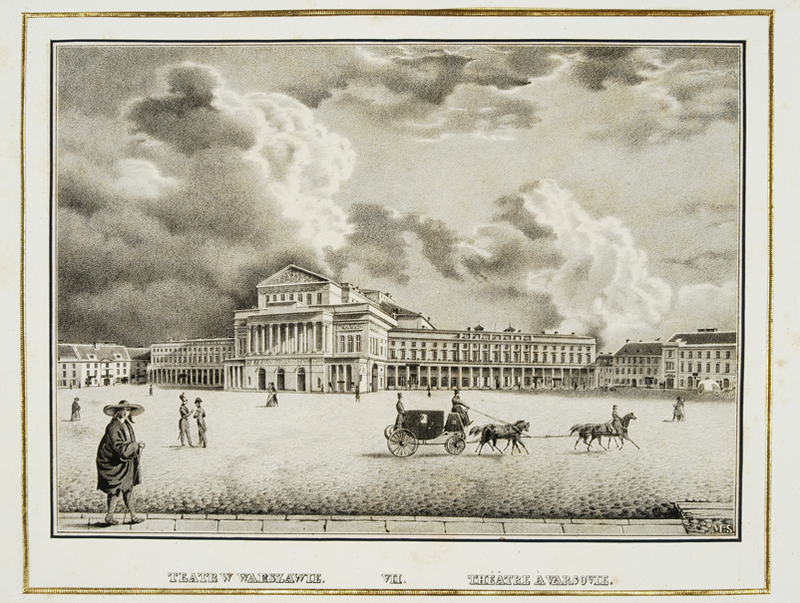 Until 1916 the whole enterprise known at first as Warsaw Theatres and then as Government Theatres of Warsaw, was administered by Russian officials. 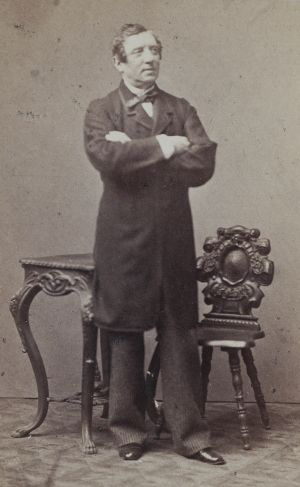 The early 19th century saw the growing division among companies specializing in either opera, ballet or drama performances, and the fact of acquiring a permanent multi-stage theatre house helped legitimized this division. This period in the history of the Grand Theatre was marked among others by the successful parade of French plays, the appearances of Helena Modrzejewska (Modjeska), the first performances of works by Polish playwrights and Stanisław Moniuszko's operas, but also by major patriotic manifestations in the country, the fire which partly consumed the Variety Theatre in 1883, and the revolutionary upheaval of 1905. After the withdrawal of the Russian authorities from Warsaw in July 1915, the management of the Variety was taken over by the 'association of comedy and drama actors' and its repertoire immediately broadened to include Romantic plays as well as the most famous works of modern drama ( by Ibsen, Gogol, and Shaw); it was also in that period that the celebrated first performance of Stanisław Wyspiański's Noc listopadowa (The November Night) took place. 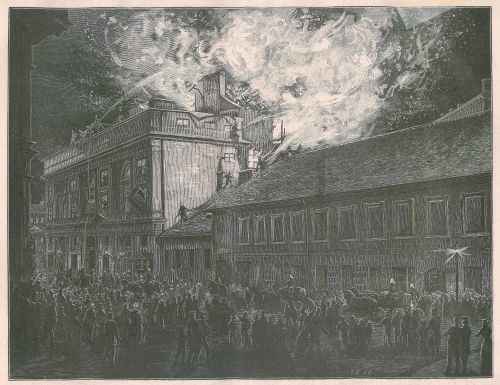 In 1919 (a year after Poland regained her state independence) the Variety gained itself a status of a municipal theatre, only to be ravaged by fire a few months later. 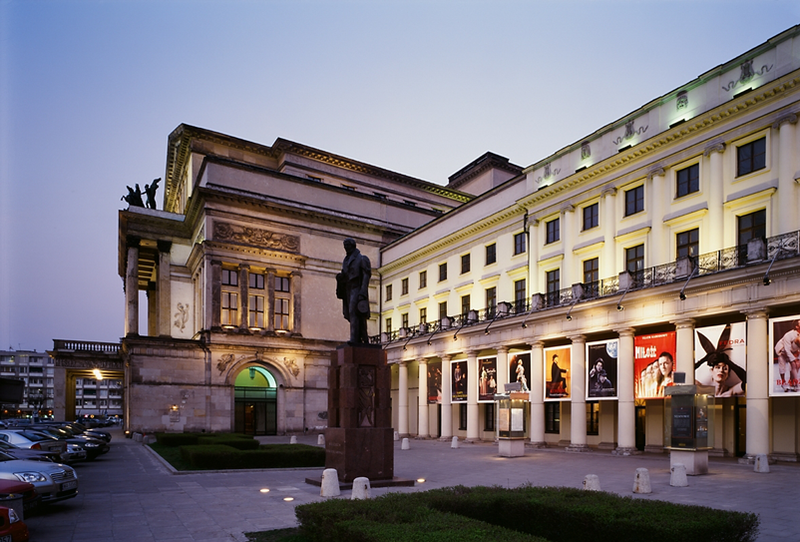 The company moved to the nearby Summer Theatre first and then to the Bogusławski Theatre. When its own stage in Corazzi building was restored in 1924, the Variety changed its name to the National Theatre. 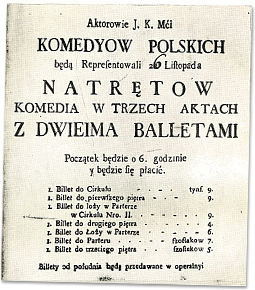 Four years later, the small-stage Nowy (New) Theatre was set up in the Sale Redutowe (Mask Ball Rooms, which in 1919-1925 witnessed the theatrical experiments of Juliusz Osterwa's Reduta Theatre). 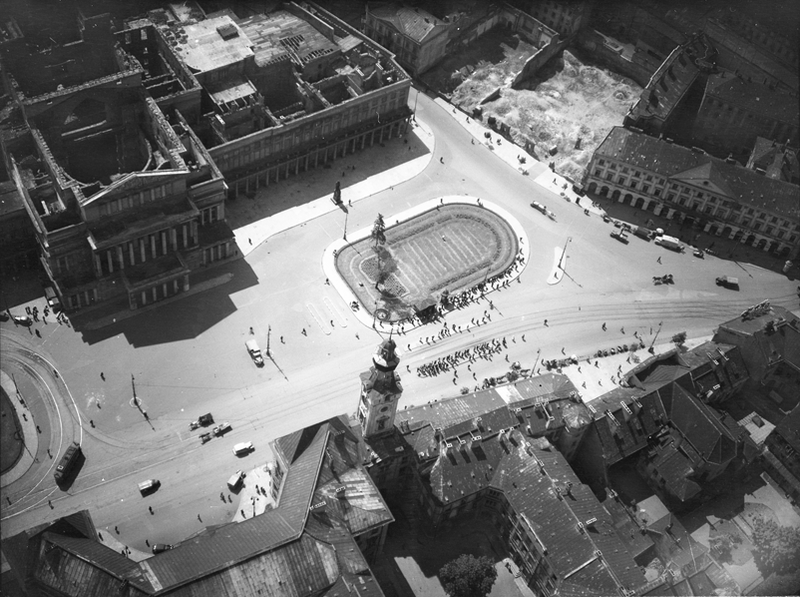 It was in this form that the National Theatre (managed by the Society for the Propagation of Theatre Art since 1934) functioned until the outbreak of World War II in 1939.
fter the cataclysms of the war years, during which Corazzi building was damaged twice - first in September 1939, and then during the Warsaw Uprising of August 1944 - the renovated National Theatre in Warsaw reopened in 1949. Its postwar fates did reflect to a large extent the major events in the history of Soviet-dominated Poland: the officially imposed madness of the so-called socialist realism, the short-lived period of relative intellectual liberty following Stalin's death in 1953, the National's involvement in the events of 1968 (when the communist leaders' decision to ban the production of Adam Mickiewicz's The Forefathers' Eve staged by Kazimierz Dejmek ignited a students revolt), and the gloomy years of the martial law in the early 1980s. 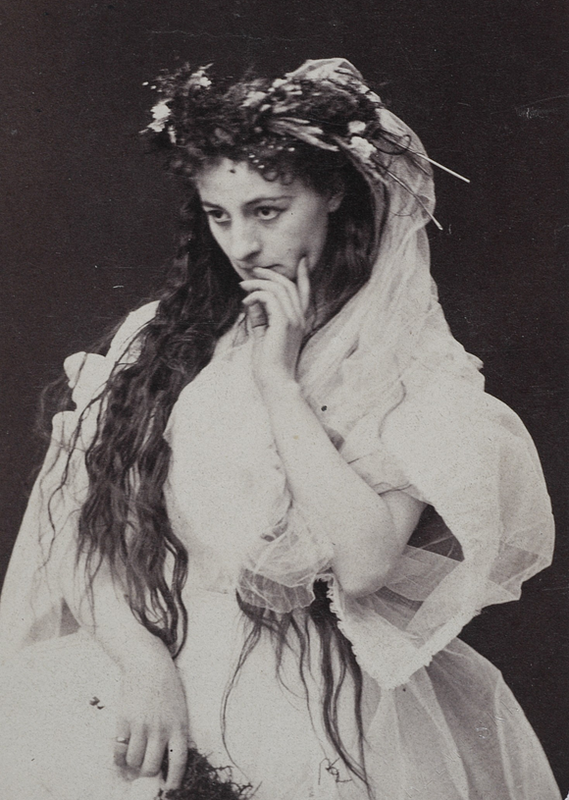 Headed by several eminent directors and famous for its celebrated actors and over a dozen splendid productions, the National was nonetheless often severely criticised by both public and theatre reviewers. In 1985 the theatre again burned out. Its reconstruction which took twelve years , was completed only after the overthrow of the communist rule in Poland. In 1997 the National Theatre was reopened under the artistic directorship of Jerzy Grzegorzewski. 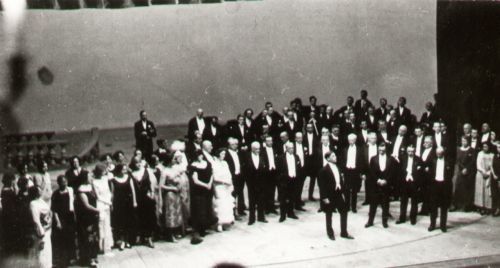 “We are constantly looking for ways of expressing his intentions in a modern stage arrangement by a modern gesture, by the modern way of speaking on the stage (...) What I have in mind here, is a manner that does not dismiss the whole experience of 20th century art, that does not reject the changes that have occurred as a result of the new experience in which the generations living after Wyspiański have taken part up to our time." Under the artistic directorship of Jerzy Grzegorzewski the National has regained its traditional position of the foremost drama theatre in Poland. Following his resignation, in September 2003, Jan Englert was appointed as a new Artistic Director of the National Theatre in Warsaw.